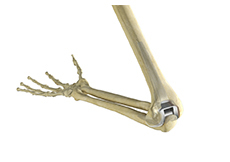 The elbow joint is comprised of three bones; the upper arm bone is called the humerus and the two bones of the forearm are called the radius and ulna. These bones are very closely matched with each other and whilst this does aid stability and excellent function it also makes them prone t injury. 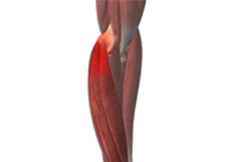 In such circumstances stiffness can also develop. 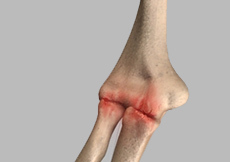 The formation of loose bodies in the elbow is usually a sign of degenerative change and osteoarthritis. Their presence can be merely an incidental finding when the elbow is being investigated for pain and stiffness, but they may also cause specific symptoms of locking and episodes of sudden severe pain. If so they can be removed with the size of the loose body will usually dictating the technique needed to remove them. Arthroscopic (key hole) or open techniques may both be used to remove them. The elbow is a particularly complicated joint as it involves three bones; the upper arm bone is called the humerus and the two bones of the forearm are called the radius and ulna. 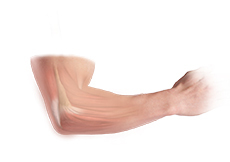 The bones of the elbow are perfectly matched to their opposing bones. This helps maintain the elbows stability, which unlike other joints, is involved in both a hinge like movement as well as forearm rotation. This complexity can however make it prone to degenerative conditions such as osteoarthritis, particularly if the joint surfaces are damaged. 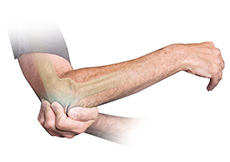 The Outerbridge – Kashiwagi (OK) procedure; this procedure is used to debride the elbow joint thereby removing any loose bodies as well as releasing any soft tissue contractures so that any restricted movement can be addressed. It is undertaken as an open procedure through an incision a 10cm incision the back of the elbow, or sometimes as an arthroscopic procedure. 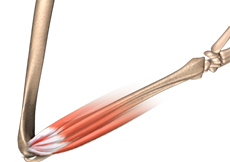 A fenestration is made through the bone of humerus from within the elbow joint, so that both the back and front aspects of the joint can be accessed. 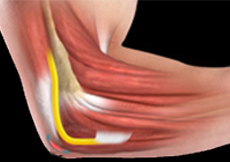 Any loose bodies, osteophytes and capsular contractions can then removed or released thereby restoring elbow movement. 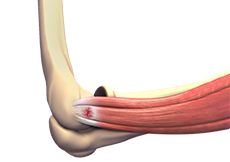 In early, but significantly symptomatic, disease a lateral elbow replacement can be undertaken. This involves replacing only the capitellum and the radial head. However, the decision to undertake such an operation is still a significant one however it carries with it none of the significant functional restrictions that an elbow replacement has as it is more robust and doesn’t have the same risks of loosening that a conventional total elbow replacement has.